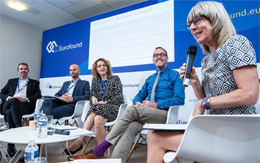 On 16 October in Brussels, Eurofound held a seminar with the theme ‘A modern agenda for work-life balance – Reconciliation of work and private life’. Participants at the seminar brought a range of points to the discussion: the far-reaching benefits of better work–life balance; the central importance of life-course perspective and the EU has an important role to play in funding initiatives, making legislative proposals and using its coordination mechanisms. 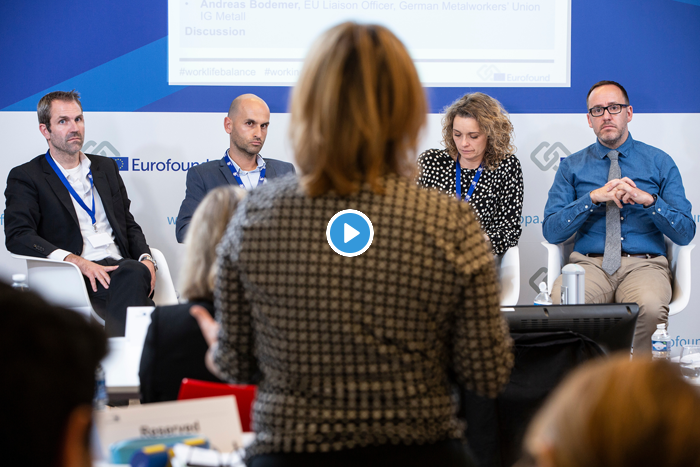 Key take-away points from the debate clustered around four themes: work–life balance and flexibility; paid and unpaid leave; gender equality; and care. Predictability and flexibility of work is essential. Younger workers have different expectations regarding working time and leave. Small improvements in flexibility can go a long way. Giving employees room to find their own solutions around working time can contribute to better work–life balance, especially in sectors such as healthcare. Technology can help to create the conditions for a better work-life balance. Father’s uptake of, say, parental leave is low; higher pay for leave and and greater social support is needed. Company policies and initiatives can help ensure that employees avail of their legal entitlements to take leave. In Member States, there is a strong correlation between robust social dialogue, better gender equality and good work–life balance. Unpaid care work needs to be valued; for this to happen, cultural changes are required. Role models in the workplace can demonstrate the value and possibility combining unpaid care and paid employment. If leave is unpaid it does not constitute a realistic choice for most workers. Parents’ working hours and their childrens’ school hours remain out of synch: better provision of out-of-school care is needed to bridge the gap. More equal sharing of paid employment and unpaid care work between men and women work is required. Tackling stereotypes is central to improving the take-up of leave and improving work–life balance. One way forward is to encourage the expression of caring traits in men and recognise care as a valid role for men. Having long-term care responsibilities impacts workers’ work–life balance. In the future, this is likely to be even more the case. Much of the burden of carer is being provided informally; a greater balance is needed between formal and informal care provision, with greater availability of affordable and accessible care. Member States need a strike a better balance between the duration of working life, and the duration of post-retirement life. With increasing life expectancy, many countries are still not adapting retirement ages. Work and care should not be considered as polar opposites. The societal valuing of care is vital; this can be encouraged from an early age. This lists some key messages that emerged from the discussions on 16 October at the work-life balance seminar. These do not necessarily represent the views of Eurofound or its Governing Board. 11.30–12.45 Panel debate 1: Business as usual?